Cambridge University now has fewer privately educated students than universities such as Bristol, Durham and St Andrews, entry figures reveal. Cambridge has only the ninth most privately educated intake, the Higher Education Statistics Agency figures show. Among mainstream universities, Oxford has the fewest state school pupils. The figures show the overall proportion of state school pupils entering UK universities has reached a record high. Dr Sam Lucy, Cambridge’s director of admissions, said her university was a “diverse place and nothing like the rumours or typical media stories”. “Myths persist, but staff and students are breaking through them,” said Dr Lucy. She said the proportion of state sector entrants at Cambridge had risen from 54% to about 62% in a decade. 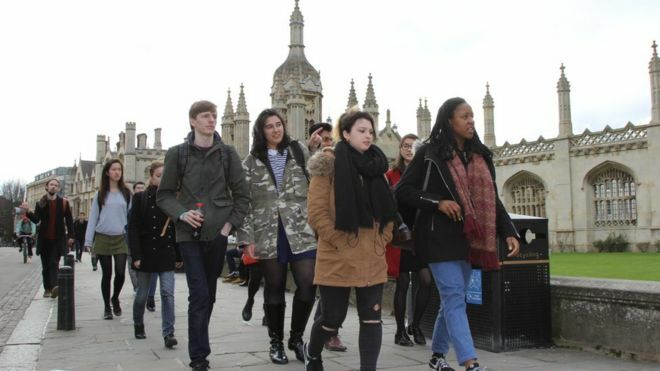 The figures reveal there are now more state-educated pupils at Cambridge – 61.9% – than Bristol, with 61.4%. In response, the University of Bristol has already announced far-reaching plans to assist applicants from poorer backgrounds or who have been at underachieving schools. Bristol will make offers two grades lower than the standard offer for applicants who have been at schools in the lowest-achieving 40% for A-level results. The university’s pro vice-chancellor, Prof Judith Squires, says its outreach efforts are already making a “hugely encouraging” impact, with the state school intake for this year rising to 64.7%. The overall UK figures, for young, full-time entrants in 2015-16, show a new high watermark for the state school university intake – nudging upwards from 89.8% to 89.9%. It shows a slow, steady rise of state pupils, up from 87.4% a decade before. But many of the most competitive universities still have high levels of privately educated students. These include specialist institutions such as the Royal Agricultural University and the Royal Academy of Music – both of which have less than half of their students from state schools. Oxford University has 55.7% of pupils from state schools – although these figures do not include the most recent intake from autumn 2016, which saw an increase. St Andrews has 56.7% of state pupils and Durham 60.5%. In contrast, Liverpool Hope and the University of Bolton had more than 99% of their intakes from state schools. There are differences across the UK – with Scottish universities on average taking a slightly lower proportion of state school pupils (87%) than universities in England (89.8%). Wales has more state school pupils at 92.8%, but by far the highest level of state pupils is in Northern Ireland’s universities, where the intake is overwhelmingly state educated, at 99.2%. Independent schools teach around 6.5% pupils in the UK, but the proportion rises to about 18% over the age of 16, according to the Independent Schools Council.